Information is static unless you have the right tools to analyze and derive intelligence from it. 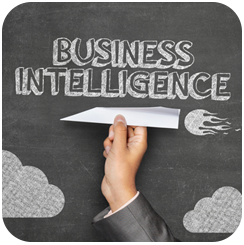 Through business intelligence (BI), companies can transform their growing data into actionable information that can be used to make more informed business decisions. Business intelligence uses a mix of technologies such as data mining, predictive analytics, event processing and text mining to analyze data from different sources, then present it in measurable platforms such as dashboards and reports to provide more meaningful insights for executives and their staff. While every company, regardless of size and industry, can benefit from business intelligence, programs must be built around operations and goals. Working with your executives and IT team, our IT specialists can model and implement a business intelligence solution using the right mix of tools, application, and processes that support your operational and strategic decision making. With outcomes, companies can gain historical, current and future views of operations to optimize business operations. One of our BI tools of choice is the SAP Business Objects BI that offers a suite of front-end analytic applications on a scalable analytic platform that supports user growth and expansion of tools and interfaces. With capabilities such as ad hoc reporting, self-service data visualization, dashboards, predictive analytics and mobile applications, SAP Business Objects BI provides the capabilities to build a flexible business intelligence solution that will drive better decision making across the organization.